How does a company combine maximum performance, quality and sustainability while minimising unit costs? Visitors to Packaging Days will find answers to this question – ENGEL Machinery (Thailand) and its partner Frigel Asia Pacific are inviting clients to the event, which takes place on 8th and 9th July 2013. In fact, the keys to success are new and high performance machines, innovative drive concepts and intelligent system solutions. ENGEL and Frigel Asia Pacific will be setting out the theory and practice of new efficiency potential at Packaging Days on the premises of Frigel Asia Pacific in Bangkok. The packaging industry is strongly consumer-driven. Unit costs and product quality are not the only concerns in the sector; companies are also under pressure to develop environmentally friendly packaging with ever greater functionality. This presents packaging manufacturers and their suppliers with special challenges that can only be resolved through research and development specific to the sector and close cooperation between all companies in the value chain. 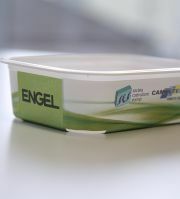 One example that ENGEL and Frigel will be demonstrating live in Bangkok is the production of highly decorated margarine tubs using thin-wall technology. Thanks to a high level of process integration, ready-to-use food packaging will be created in a single work step. With all system components perfectly coordinated, the result is maximum productivity and minimal energy consumption. At the heart of the manufacturing cell is an all-electric ENGEL e-motion 440/160 T injection moulding machine equipped with a two-cavity mould and a high performance in-mould labelling system. Cell’s cooling requirements are handled by the latest equipment from Frigel in controlled process cooling. “In the packaging industry, all-electric ENGEL e-motion injection moulding machines are being used more and more often in high performance applications”, reveals Gilles Lefevre, Managing Director of ENGEL Machinery (Thailand) in Bangkok. “The consistent ongoing development of this model series is what makes this possible.” The latest generation of ENGEL e motion injection moulding machines achieves cycle times of well under 3 seconds and injection speeds of more than 500 mm per second, a performance class that was long the domain of hydraulic accu machines. “We can now combine top performance with maximum energy efficiency thanks to all-electric drive technology”, says Lefevre. The Frigel refrigeration technology in the unit on display at Packaging Days also makes a critical contribution in terms of lowering energy consumption values. Other cooperation partners attending the event will include Campetella (specialising in IML automation), Verstraete (in-mould labels), SCS (moulds), Borouge (granules), Matsui and Factor 4 (dehumidifying, dosing and conveying equipment). Plastic packaging is undergoing a global boom at present, with southeast Asia at the forefront of the trend. According to a recent study by the market research firm Freedonia, the Asia-Pacific region is set to become the world’s biggest market for caps and closures by 2016. On 1st April 2013, ENGEL addressed the growth surge in southeast Asia by establishing a Bangkok branch. Thanks to its breadth of expertise in injection moulding machines, technology and system solutions, ENGEL is able to obtain the highest efficiency factors for all packaging applications, from one-gram bottle tops to 150-kilo industrial containers. To achieve this, all-electric ENGEL e-cap injection moulding machines, tie-bar-less ENGEL victory and e-victory machines and large-scale machines in the ENGEL duo range (amongst others) are used alongside ENGEL e-motion injection moulding machines. ENGEL is now the only western producer of injection moulding machines with two production sites in Asia (China and Korea). This enables the company to guarantee very fast delivery times. ENGEL supplies turnkey system solutions from a single source around the world; in addition to injection moulding machines, these include automation, process technology, mould project planning and peripheral units. ENGEL also takes general responsibility (even for system components created through collaborations with partners), thereby raising the efficiency and competitiveness of its clients even at the project planning phase.